Cheryl Reeve says Collier can do it all. 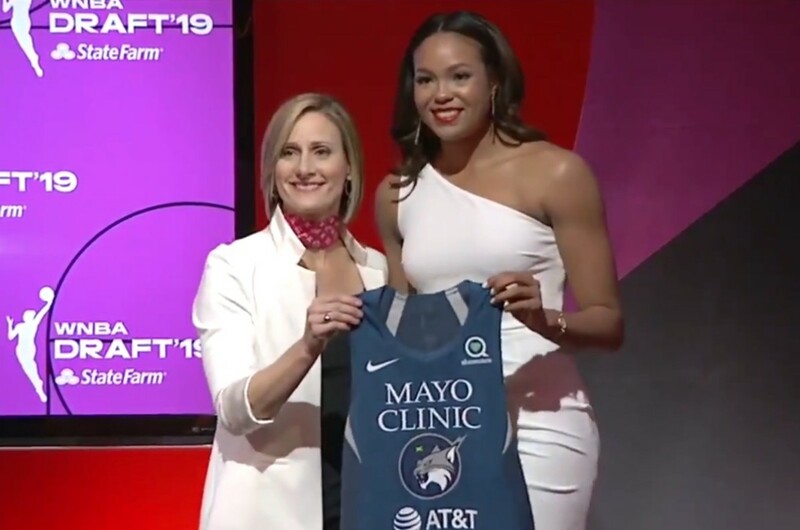 With the sixth pick in the 2019 WNBA Draft, the Minnesota Lynx selected University of Connecticut star Napheesa Collier – and then used the 30th overall pick to take former Gophers star point guard Kenisha Bell. Amazing fact about Collier: She&apos;s one of five players to score 2,000+ points and 1,000+ rebounds in her college career, joining Maya Moore, Tina Charles, Breanna Stewart and Rebecca Lobo, according to the Lynx. That&apos;s some elite company for Collier, who at 6-foot-2 will have a chance to make an immediate impact in Minnesota&apos;s lineup. Collier averaged 20.8 points, 10.8 rebounds 3.5 assists, 1.5 steals and 1.7 blocks per game this past season, helping lead the Huskies to the Final Four. The first team All-American (2019 and 2017) was referred to as a Swiss Army knife by Lynx head coach Cheryl Reeve, while ESPN&apos;s draft covered called her the most complete player in the draft. Minnesota followed up the pick of Collier with a trio of selections in the second round, and then ended the draft by taking Bell from the Gophers in the third round. “She defends and she’s an elite athlete. Those two things are an automatic get her in to camp and see if you can learn about her offensively,” Reeve said. Minnesota traded Heideman to the Connecticut Sun in exchange for guard Lexie Brown, who was the ninth overall pick in last year&apos;s draft. The Lynx open the WNBA season May 10, which is now less than one month away. This is as classy as it gets. The Lynx dominated most of the survey, but not the most important vote. Reeve is the eighth coach in league history with 200 wins. Reeve says it feels like another slap in the face to women's sports.